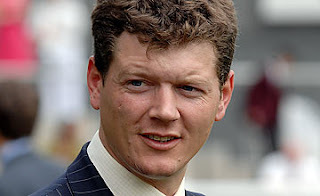 If anyone was born to be a racehorse trainer it was, surely, Andrew Balding. He is, of course, the son of Ian Balding, who trained the Mill Reef – winner of the Derby, the Coral-Eclipse, the King George VI & Queen Elizabeth Stakes and Prix de l'Arc de Triomphe in 1971 – and the nephew of the late Toby Balding, who trained winners of the Champion Hurdle, the Cheltenham Gold Cup and the Grand National. Balding Jnr began his training career as assistant to his uncle and subsequently to his father, before taking over the licence at Park House stables at Kingsclere, Berkshire in his own right in 2003. Six months later, his sister, Clare, who was on anchor duty for the BBC at Epsom, was reduced to tears when Casual Look held on to beat the favourite, Yesterday, by a neck in the Oaks to give the fledgling trainer his first Classic winner. After a dream start, further success at the highest level proved elusive, although Phoenix Reach progressed into a top-class international performer, winning the Canadian International at Woodbine at three, the Hong Kong Vase at Sha Tin at four and the Dubai Sheema Classic at Nad Al Sheba at five. Bonfire, owned by the Highclere Stud, started second favourite for the Derby in 2012, but could only finish sixth of nine, beaten 13½ lengths, behind the winner, Camelot. More recently, Balding won the Mackinnon Stakes at Flemington, Australia with Side Glance in 2013 and the Sussex Stakes at Goodwood and the E.P. Taylor Stakes at Woodbine with Here Comes When and Blond Me, respectively, in 2017. Aside from the two Group 1 wins in 2017, domestic Group 2 wins by Beat The Bank, Blond Me and Montaly contributed to his best ever season, in terms of prize money, with £2,830,527 banked. The 2018 season is still in its infancy, at least as far as the trainers’ table is concerned, but Andrew Balding has already saddled 8 winners from 37 runners at a strike rate around 22%. His typical seasonal total, of 100+ winners, looks well within his compass, once again, by the end of the current campaign.